Getting ready for the CWA Twilight Markets now moved to 18th April because of lots of rain in SE Queensland, I made a nuno felt scarf the other day. It is totally different to anything I’ve made before and I love it! 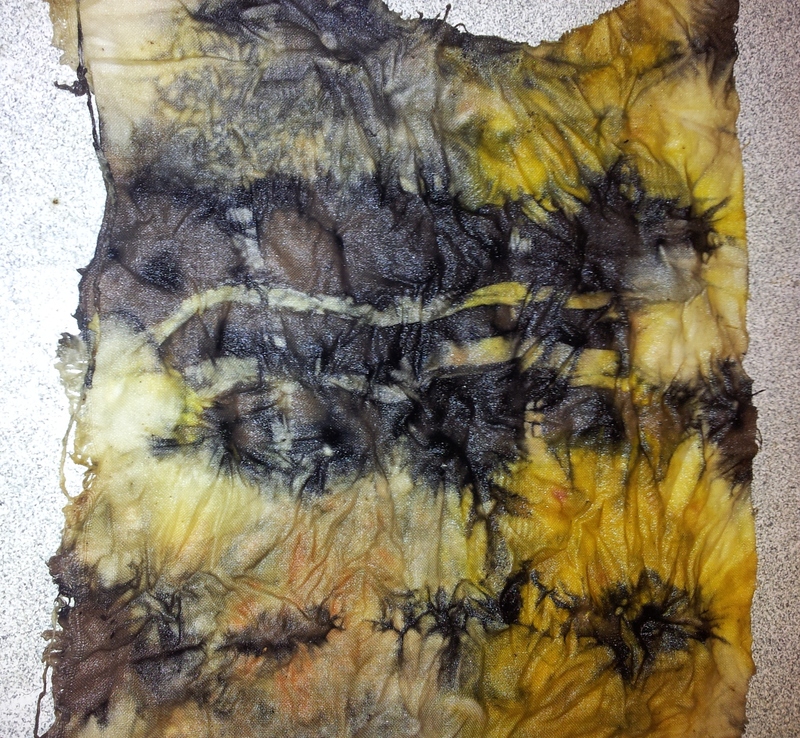 Using a thin strip of black chiffon, I laid the wool rovings well over the edge to get a softer edging. 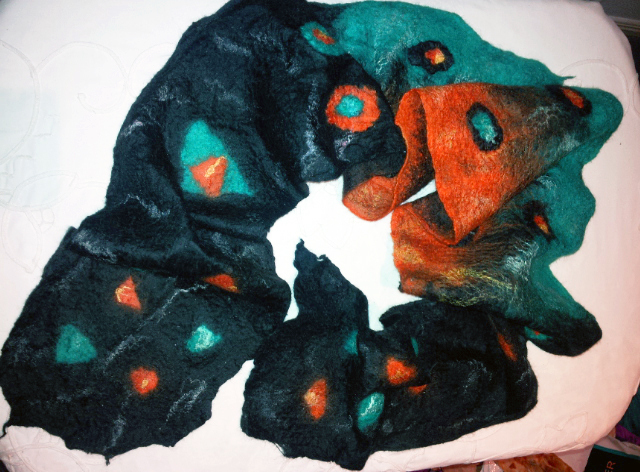 I also made some pre-felts of bright orange and turquoise/teal which I cut and laid out on the top with other bits of wool shapes and lots of hand-dyed silk tops. 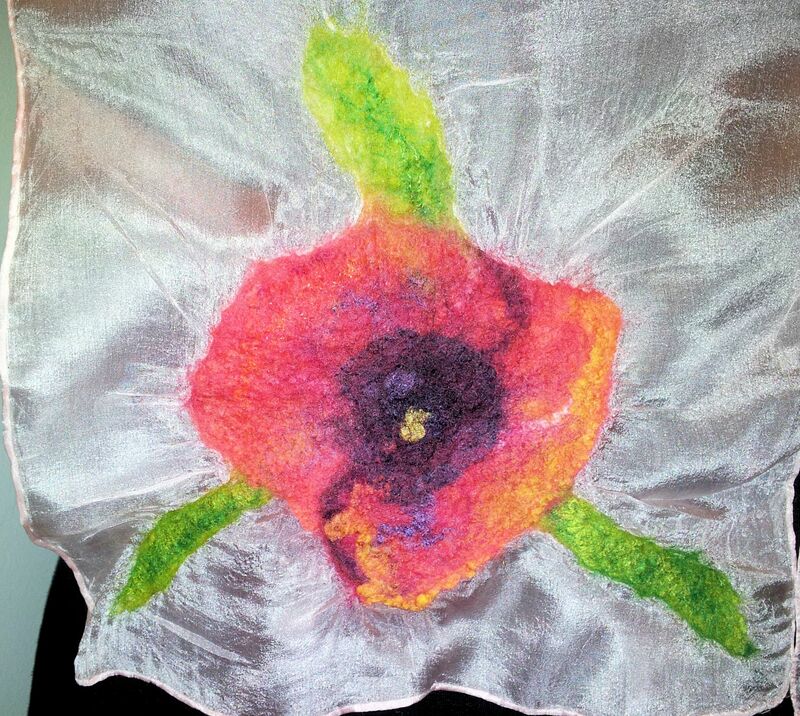 It was fun to make as I haven’t felted much lately and I was very eager to see the outcome of this one. Where did those days go? 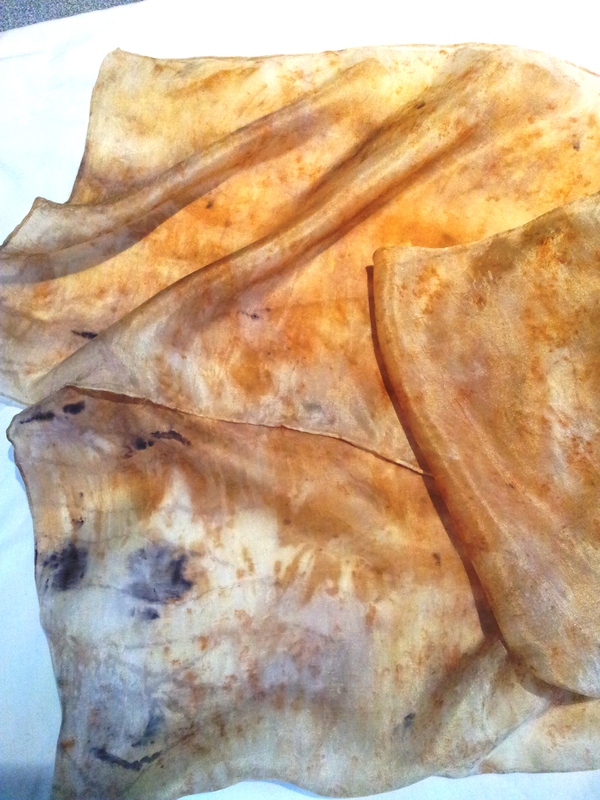 I’ve a few photos of results from the last couple of eco-dyeing batches, which I’ll list below. 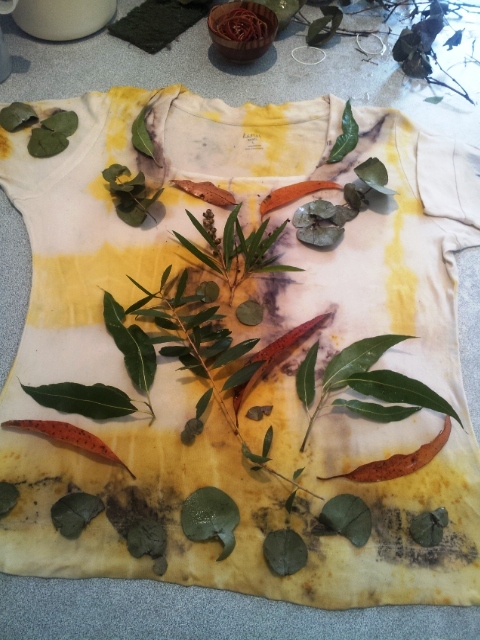 After waiting for the scarves to cool, I unwrapped them, picked off the leaves, hung them out to dry – and then rinsed them in water with splash of vinegar (silk likes that) and finally ironed them dry. 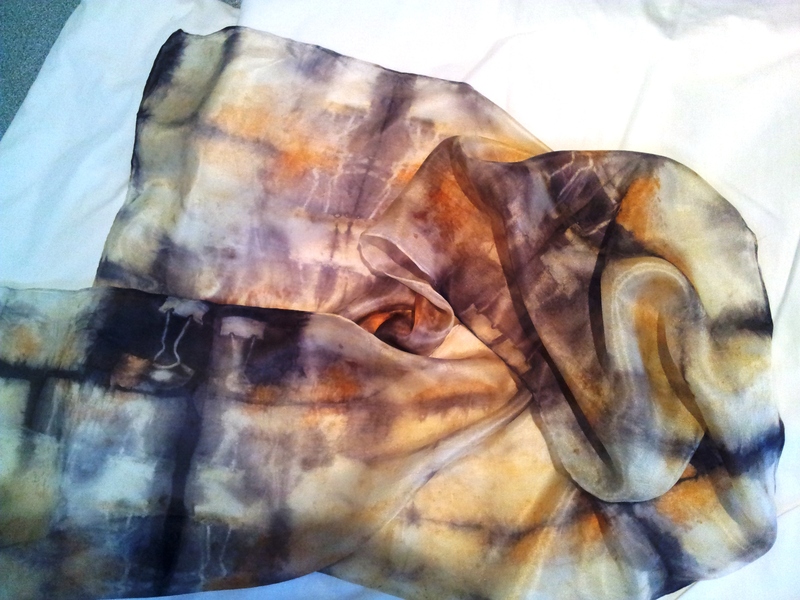 Scarf over-dyed with tea on eucalyptus dyed silk. Dark grey spots from rust. I really like how this one turned out. 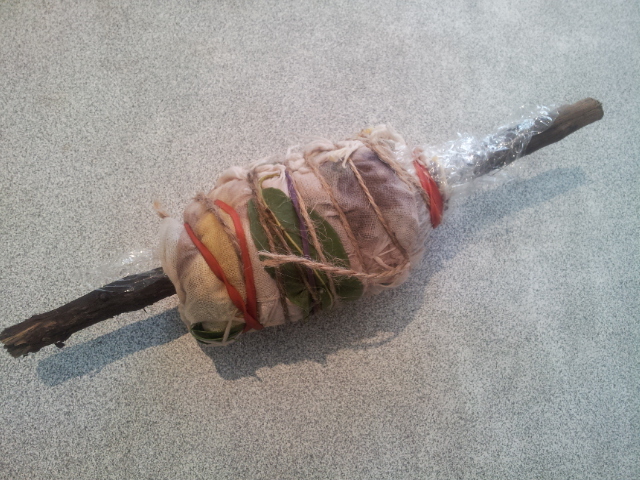 While the sage leaves didn’t really leave any colour, they did act as pale resists in some places. 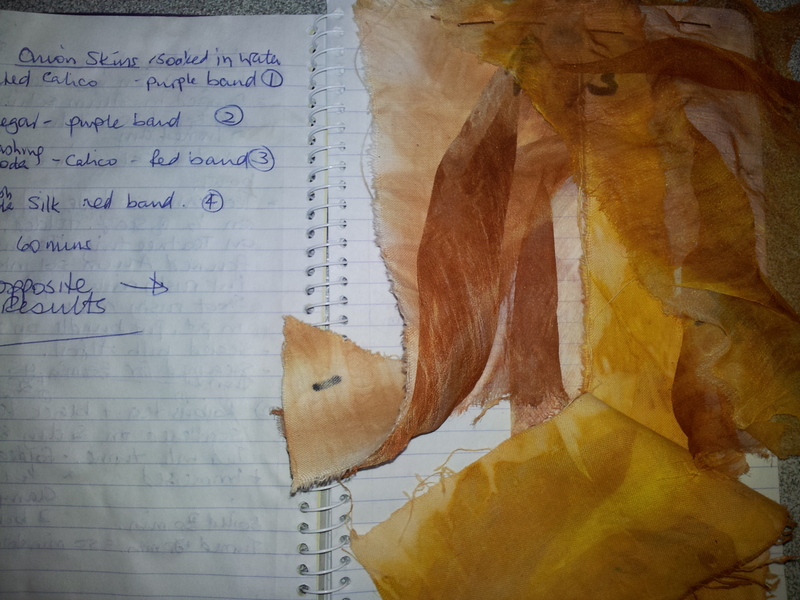 However, the roibus created some vivid russet marking and the black tea produced grey. 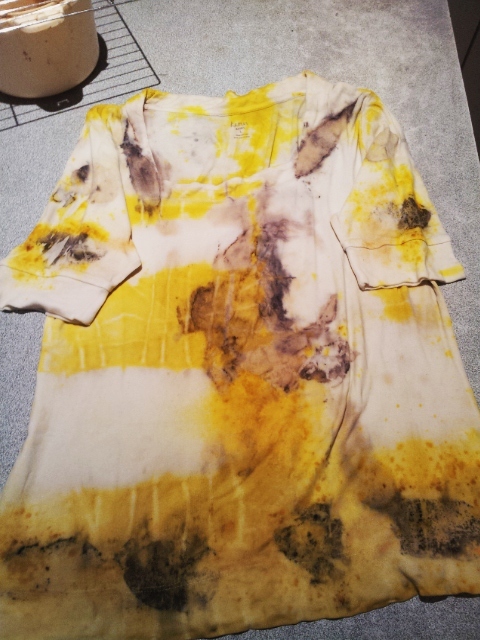 Where the dye-bath (tea, rusty iron, alum) saturated the material, it stained it a lovely dark grey-black. There is a pattern that repeats, showing how it was folded, and the bull dog clips acted as strong resists that left clear marks on the background. 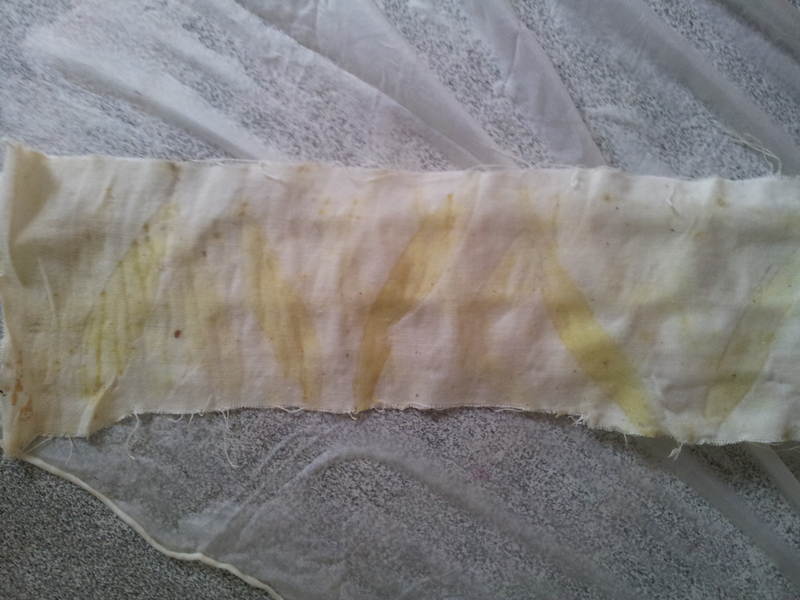 Scarf freshly unbundled, before ironing showing repeating pattern created by folding material pre-dyeing. 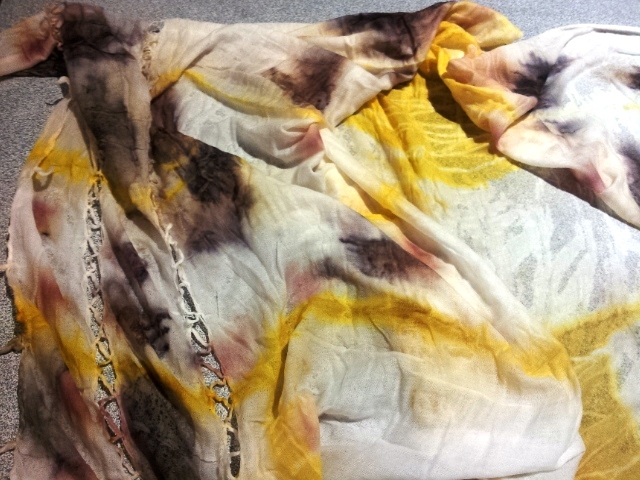 This scarf has given me the confidence to experiment further with different dye-baths, and eco-print materials and mordants! 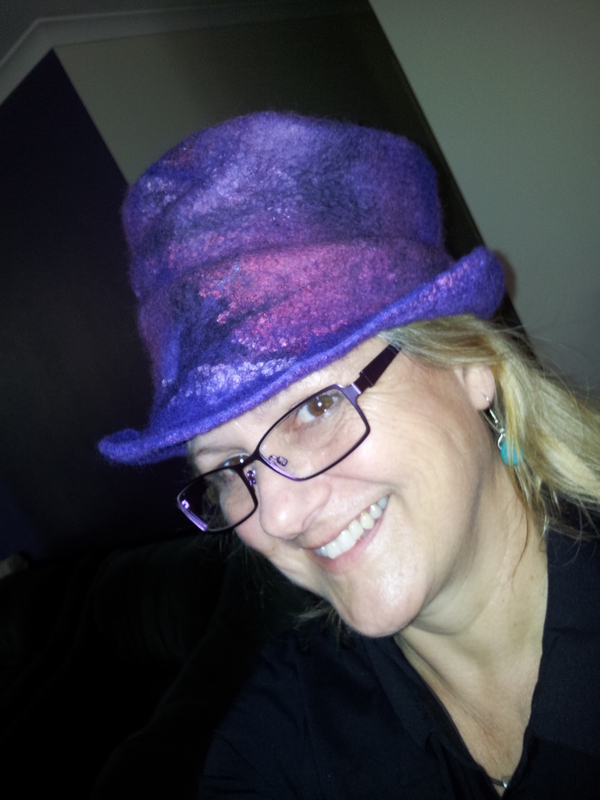 I said in my last post that I’ve been asked to make a felt hat for a Christmas present. The lady wanted purples, maroons and a bit of black. 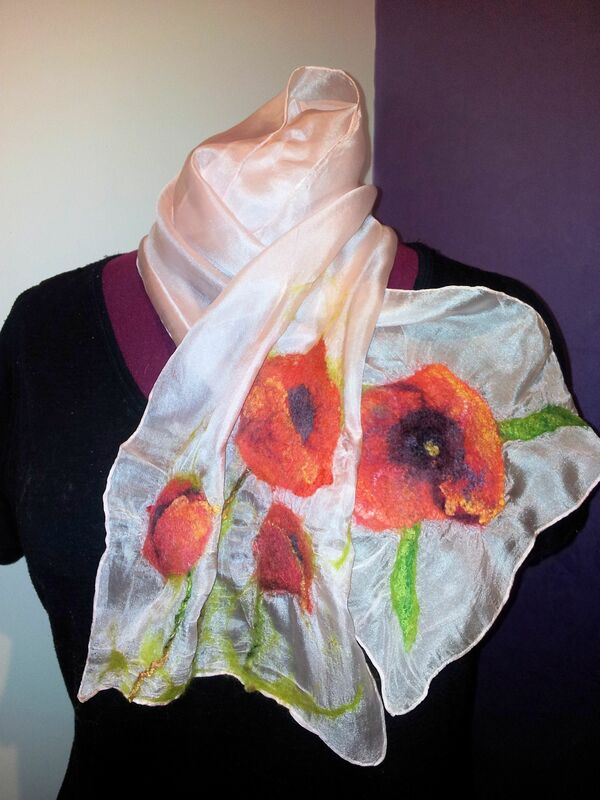 So here it is – You can see the silk hankies shining through – and the mottled colours blending together. I’m very happy with how it turned out and want to make one for myself next! 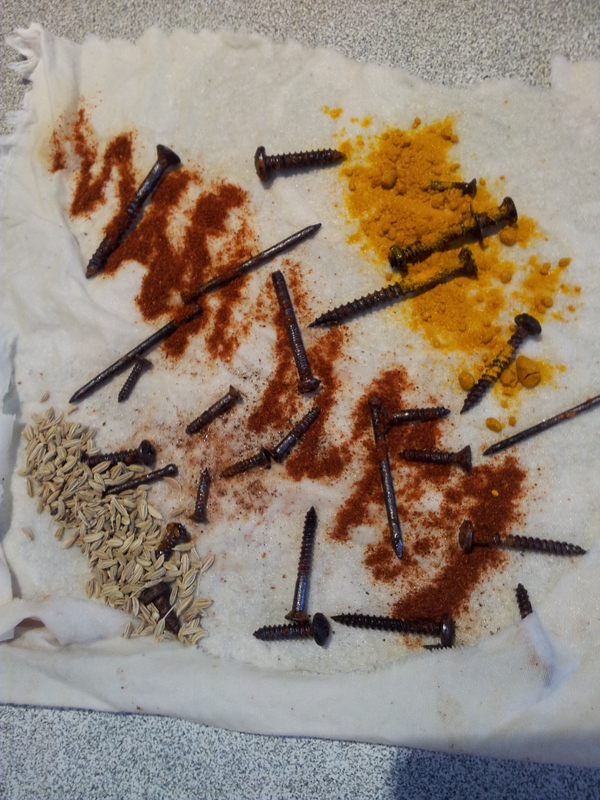 In the next post I’ll diarise the actual process for anyone interested. Just finished this for a customer. 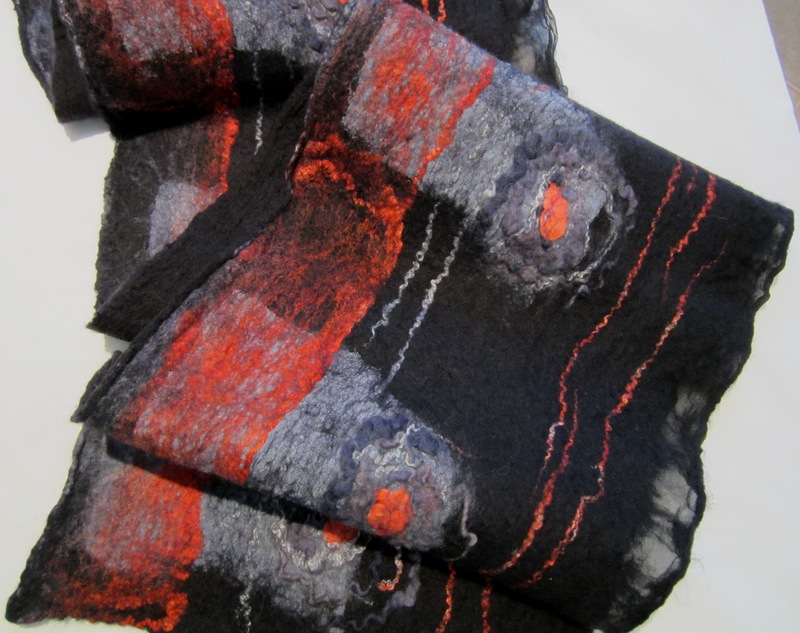 It is made with black tissue silk that has black and red merino wool, red silk tops and dimensional wool felted to it. I have to say it wasn’t the easiest scarf in the world to do. Not because I couldn’t lay the wool fine enough, or dye the tops the right colour, or make the ‘roses’. This time, and for the first time ever (which was bit of a blow to my ego that likes to get things right immediately), I had difficulty translating what the lady wanted and making it reality. 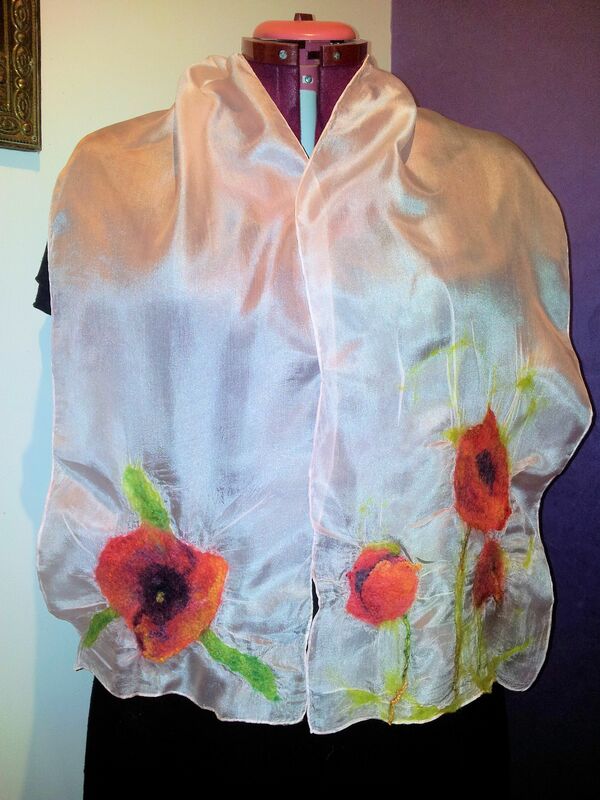 This is actually version two of the scarf – the first one is shown in a previous post. 1. Not listening to my intuition that told me it was going to be tricky when my customer wanted me to mix two different styles of felting (this fine nuno-felt style with cobweb style). 2. 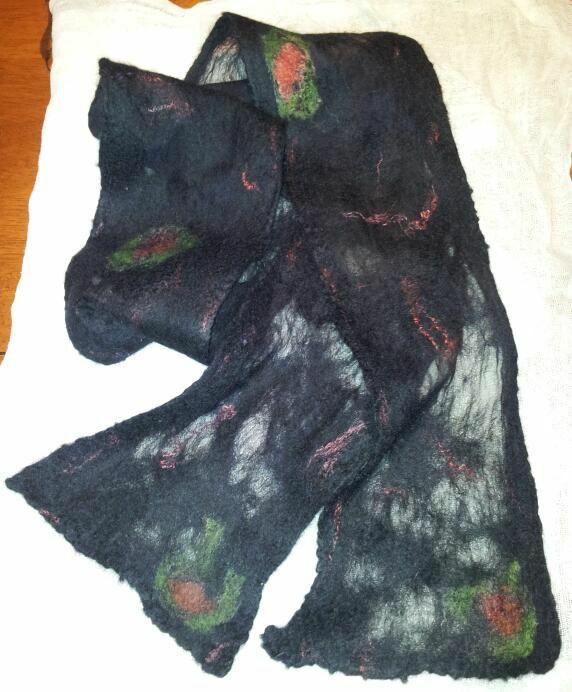 Getting caught up in trying to adhere to my customer’s specific and detailed wishes and not putting in certain things – rather than listening to my intuition when I was making it, that told me to make it a certain way (which is basically how this second scarf turned out) in the first place. Both of these mistakes feature my intuition and lack of listening to it. 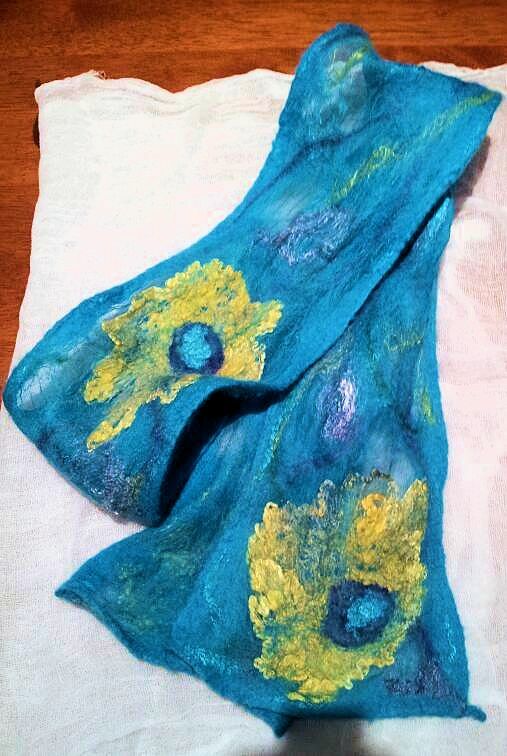 So, two scarves later, I now have one satisfied customer and one extra scarf to sell to another owner. That’s the beauty of making accessories and artwork, I make something and one day the person it’s made for turns up, falls in love and takes it home. It’s so satisfying! The original scarf by the way, is also nice. 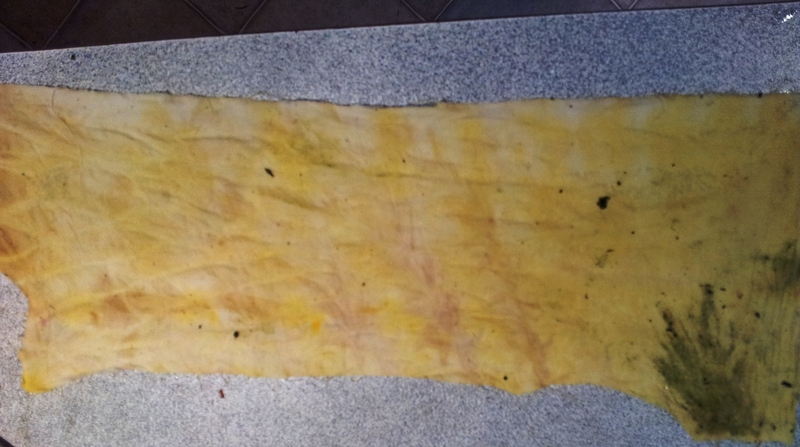 It is more subtle with more black and less red, and with slightly more felt coverage to the tissue silk. The roses are small and have little green leaves. Here’s a photo for comparison. 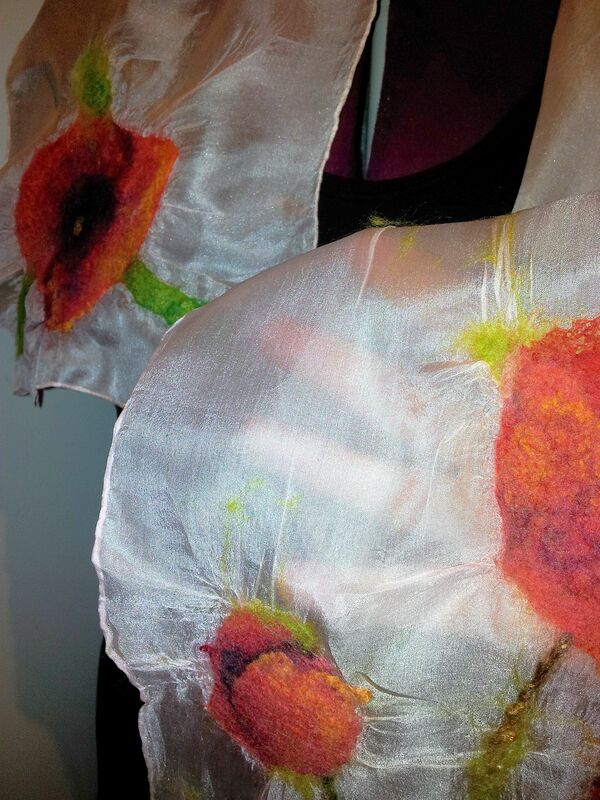 I’m thinking of making a massive big, bright red felt flower and attaching it to one end. 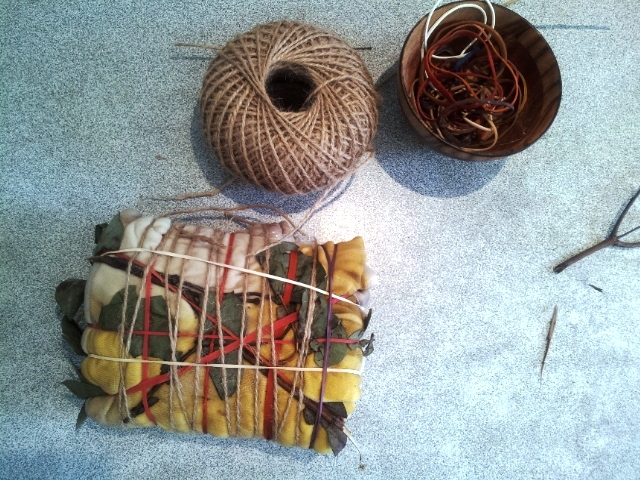 I had a lovely weekend making two nuno felt scarves by commission from two lovely ladies. One was in turquoise to go with the lady’s lime green and turquoise outfit and the other was a more subtle one in black with fine red silk tops and roses throughout. 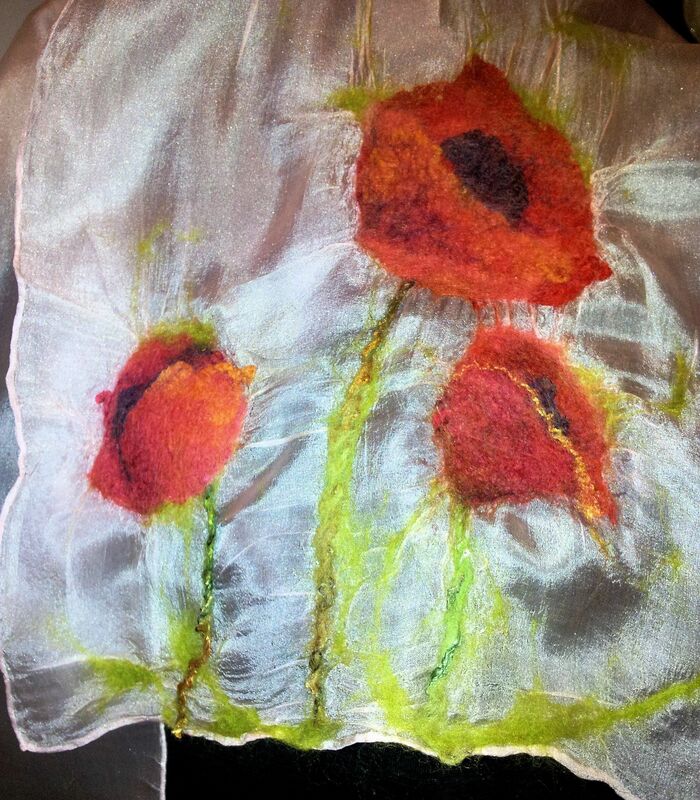 Both consisted of merino wool and various types of silk (hankies, tops etc) felted onto tissue silk that I had hand-dyed the day before. 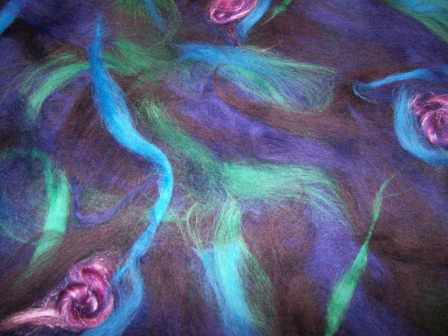 Most of my felting is very free form in the way I put colours and design together. It starts like this … and I feel my way with the project, which is a very organic coming together of colours and patterns until I love, love, love it! If I’m working for someone, I focus on their energy while I’m working. That’s something I can’t explain to anyone left brained enough to want proof, but it’s a thing I do when I’m making felt, that also helps me get accurate readings for folks when they come see me for tarot readings. I think it’s a genetically inherited ability because my dad used to get psychic insights in front of those old roaring log fires way back when people actually used real trees instead of those ceramic logs that zip into flame with tongues of ignited natural gas. 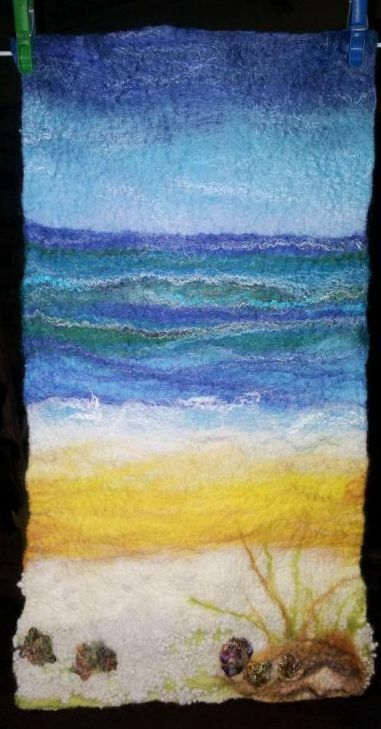 I’ve been thinking about felt designs today as I’ve rolled out pastry in my part-time job – which I have to say is the best little job in our small town, and which I sincerely try to fit into – but honestly, it’s a bit like a star-shaped peg squeezing herself into a square-shaped hole. It’ll work some of the time, but the rest of the time either the star gets cramp in her pointy bits, or the square gets prickly trying to reinforce its shape. (You’ve can’t help but feel empathy for both the star and the square really). Again, here’s another area where I’ve done my best to conform, but my arty intuitive self just keeps failing! Normally, I’d balk at the thought of failing at anything, but this time I’ve come to realise, failure can sometimes be a kind of self-preservation at the soul level. Being a bit of an intuitive people pleaser means I can’t stand to feel the square reinforcer’s (and I use that term symbolically to illustrate my point here) irritation at my inadvertent bucking of the system – or should I say systems – as the whole job is broken down into methodical, productive systems – but I’m learning to live being constantly corrected for the sake of my sanity. I also admit that I can be a bit of a square reinforcer at home when my pointy star-shaped teenage son shines brightly all over the place but doesn’t stop anywhere long enough to finish a job… “Oy, empty the recycle bin! !” Enough said. So, there I was today, body doing the job, mind doing its own thing when it could, and I thought how nice it would be to embrace the square long enough to be able to do the part-time job better and also to create something more tailored than my usual freehand style of design. I was commissioned at Christmas to create a black scarf with a “reserved pattern” for someone who doesn’t like to stand out in a crowd, but whom I’ve met once and was impressed by her vivaciousness which I think under other circumstances or cultural background may be more forthright. The scarf I made for her was quite challenging at first, as I had to put some actual left-brain logical thought sequencing to the structure of the design and colours. So despite my initial anxiety at creating this scarf, I fell in love with it. And it is this boxy black and grey scarf that is the inspiration for my next work. Simple, structured design but using colours that are bold yet harmonious. With the Easter long weekend coming up, I’m looking forward to playing!